Former Supreme Court Justice Yang Sung-tae was arrested Thursday on charges that he abused his power to influence politically significant trials and disadvantage justices critical of him. The Seoul Central District Court issued the arrest warrant, citing that his charges are proven, the risk of him destroying evidence and the gravity of the case. He was immediately taken into custody at the Seoul Detention Center, south of Seoul. In a dramatic fall from grace, the veteran judge with a career of more than 40 years became the first former or incumbent Supreme Court chief justice to be arrested in the judiciary’s 71-year history. Yang, who headed the country’s top court from 2011 to September 2017, was accused of using trials as political leverage in his dealings with former President Park Geun-hye. He is suspected of pressuring judges to deliver verdicts in the Park administration’s favor and of penalizing judges who opposed him. One of the high-profile cases in which Yang is suspected of interfering involved Koreans forced to work for Japanese companies during Japan’s 1910-45 occupation of the Korean Peninsula. Yang is suspected of having orchestrated a delay in the deliberation of a lawsuit filed by the victims, mindful of the Park administration’s wishes to mend ties with Japan. 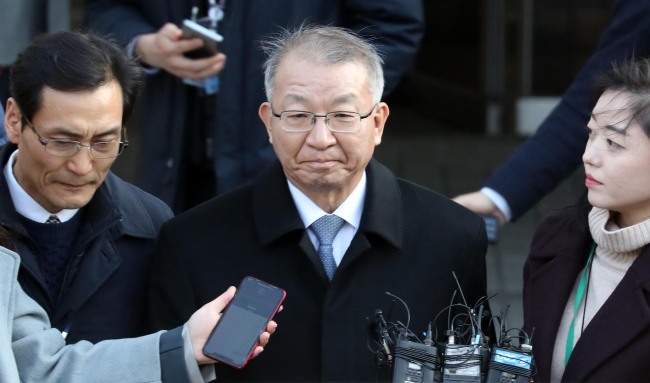 The court denied the arrest warrant for retired Justice Park Byong-dae, former head of the National Court Administration, the top court’s governing body, for his involvement in the alleged crime. Yang is to be grilled by prosecutors as early as Friday. The prosecution is expected to file charges against Yang and other suspects involved in the scandal before the 10-day detention period expires. Prosecutors could ask for an extension of his detention by 10 days. Yang faces 40 charges including abuse of power, leaking of state secrets and dereliction of duty. 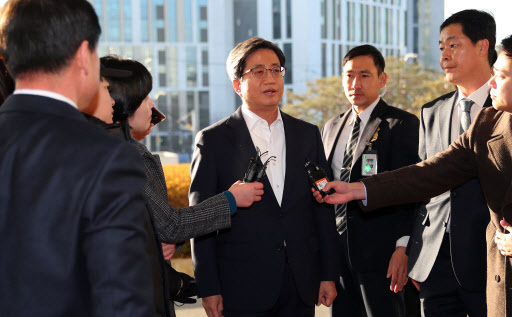 After Yang was arrested, incumbent Supreme Court Chief Justice Kim Myeong-su apologized over the arrest of his predecessor, who is at the center of a power abuse scandal that damaged the public’s trust in the judiciary. The political circle had mixed reactions. The ruling Democratic Party and minor opposition parties including the Bareunmirae Party, Democratic Peace Party and Justice Party welcomed the arrest of Yang, hailing it as “legal justice served.” They say it should serve as a chance to restore trust in the judiciary. The main opposition Liberty Korea Party, to which ousted ex-President Park had belonged, expressed discomfort over the decision and called on the Moon Jae-in administration to stop its unreasonable campaign of fixing social ills.